Galaxies are the basic building blocks of our Universe. They are massive gravitationally bound collections of stars, gas, dust and dark matter. Studying how galaxies form and evolve over cosmic time informs not only cosmological surveys which uses them as tracers for the structure of the Universe, but also teaches us about the basic physics of star formation and the content of the Universe. 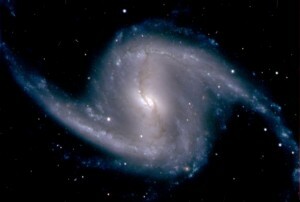 Barred spiral galaxy NGC1365, imaged by DES during its first light. Research at the ICG into galaxy evolution covers galaxies from the most local, to some of the most distant objects known. We search for clues to reveal galaxy evolution via the types of stars, and the star formation histories of galaxies (reconstructed from either photometry or spectra with the help of state of the art models of stellar populations), as well as in the composition (elemental make up) of the stars and gas in a galaxy, and the orbital dynamics revealed either through stellar or gaseous kinematics, or in a frozen snapshot in the galaxy morphology. At the ICG, we are leading and involved in many major new and current surveys which can be used to study galaxy evolution. Within the Sloan Digital Sky Survey (SDSS; www.sdss.org) we lead the Galaxy Evolution Working Group for the Baryon Oscillation Sky Survey (BOSS), and science working groups for the Mapping Nearby Galaxies at Apache Point Observatory (MaNGA), as well as the science team for the Galaxy Zoo project (www.galaxyzoo.org). We also lead the Galaxy Evolution group for the Dark Energy Survey (DES; www.darkenergysurvey.org), and are involved in Galaxy Working groups for Euclid (www.euclidmission.org). – Star formation rates and masses of z ~ 2 galaxies from multicolour photometry, Monthly Notices of the Royal Astronomical Society, Volume 407, Issue 2, pp. 830-845. (2010), Claudia Maraston, Janine Pforr, Alvio Renzini, Emanuele Daddi, Mark Dickinson, Andrea Cimatti, Chiara Tonini. – The different star-formation histories of blue and red spiral and elliptical galaxies, Monthly Notices of the Royal Astronomical Society, Volume 432, Issue 1, p.359-373 (2013), Rita Tojeiro, Karen L. Masters, Joshua Richards, Will J. Percival, Steven P. Bamford, Claudia Maraston, Robert C. Nichol, Ramin Skibba, Daniel Thomas. – The Morphology of Galaxies in the Baryon Oscillation Spectroscopic Survey, Monthly Notices of the Royal Astronomical Society, Volume 418, Issue 2, pp. 1055-1070 (2011), Karen L. Masters, Claudia Maraston, Robert C. Nichol, Daniel Thomas, Alessandra Beifiori, Kevin Bundy, Edward M. Edmondson, Tim D. Higgs, Alexie Leauthaud, Rachel Mandelbaum, Janine Pforr, Ashley J. Ross, Nicholas P. Ross, Donald P. Schneider, Ramin Skibba, Jeremy Tinker, Rita Tojeiro, David Wake, Jon Brinkmann, Benjamin A. Weaver. – Stellar velocity dispersions and emission line properties of SDSS-III/BOSS galaxies, Monthly Notices of the Royal Astronomical Society, Volume 431, Issue 2, p.1383-1397 (2013), D. Thomas, O. Steele, C. Maraston, J. Johansson , A. Beifiori, J. Pforr, G. Strombaeck, C.A. Tremonti, D. Wake, D. Bizyaev, A. Bolton, H. Brewington, J.R. Brownstein, J. Comparat, J.P. Kneib, E. Malanushenko, V. Malanushenko, D. Oravetz, K. Pan, J.K. Parejko, D. P. Schneider, A. Shelden, A. Simmons, S. Snedden, M. Tanaka , B.A. Weaver, R. Yan. – Environment and self-regulation in galaxy formation, Monthly Notices of the Royal Astronomical Society, Volume 404, Issue 4, pp. 1775-1789 (2010), Daniel Thomas, Claudia Maraston, Kevin Schawinski, Marc Sarzi, Joseph Silk.